Bhasuri Inn is blessed to be strategically located very close to the Guruvayoor Temple where one gets to see as high as 200 weddings in a day. Weddings are as much commonplace as auspicious in this small town, so the grand Wedding Hall In Guruvayur | Bhasuri Inn provides the ultimate ambience and arrangements for the wedding experience everyone deserves. A wedding hall in Guruvayur is more than just a space for solemnising the auspicious event of uniting two souls for life. It encompasses several elements – the catering service, the flowers and decorations,event planning, guest seating and entertainment, the list goes on. Bhasuri Inn as one of the most renowned wedding planners in Thrissur gives its best when it comes to planning the minutest details of a wedding. We make sure every wedding is a grand success, and every guest leaves smiling and satiated. How to select a wedding hall that fits your bill and expectations too? 1. Fix your budget: First things first. Having a budget in mind saves you from the pitfall of falling in love with a marriage venue, only to know it is way out of reach. 2. Have an estimate of the number of guests: Different wedding halls have different capacities, so choose the one that has a capacity slightly above the number of guests you’d be expecting. 3. Check for date availability: Popular wedding halls fill fast. So check if the hall is available on the said date. 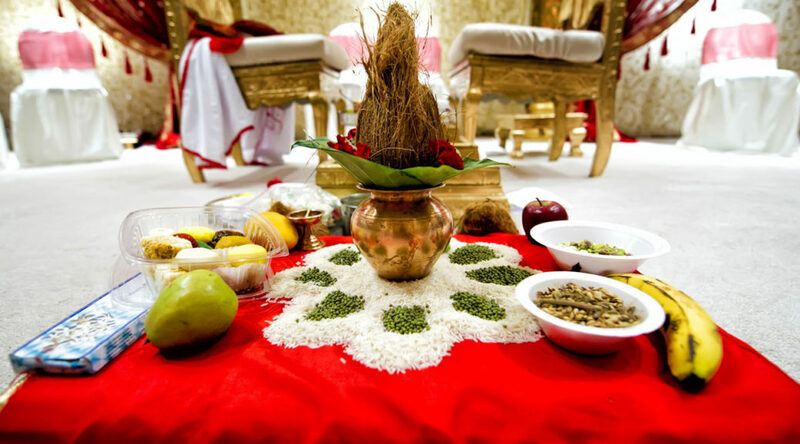 If your marriage is taking place in Guruvayoor temple, you need to check first with the temple before deciding the reception venue. 4. Venue ambience: Different wedding halls have their unique presentation styles. Check if the venue suits the mood and style you wish to set for your wedding. 5. Service quality: Check out the add-on services provided by the hall provider. If they provide catering, try out their menu. Pay attention to their professional attitude and customer interaction. At Bhasuri, we provide sumptuous feast (sadya) for wedding guests, manage decorations and lighting in a most professional way, and can provide luxury accommodation for the wedding party. We also give a helping hand with the event management activities and make sure everything goes smoothly. A wedding hall is a venue that stays in your cherished memories for a lifetime. So give it a good deal of thought and fix the venue only if completely satisfied with its settings and quality service. Every wedding deserves a memorable venue, so go ahead and find yours. It’s appropriatge time too make some plans for tthe futire andd it’s time too be happy. Thanks for a marvelous posting! I seriously enjoyed reading it, you are a great author.I will make certain to bookmark your blog and may come back later on. I want to encourage you to definitely continue your great writing, have a nice weekend!